Four young and talented musicians have joined forces in Eklipse; Helena (Cello), Viola (Viola), Miss E. (Violin) and Scarlett (Violin). Yes, this is a string quartet and the album offers us their interpretations of contemporary music from artists like Linkin Park, Lady Gaga, Kate Bush, Justin Timberlake, Depeche Mode as well as soundtrack music. And why are they featured on this site? Only reason is that some of you will most likely run into them this summer: they are supporting Nightwish on their European Tour. 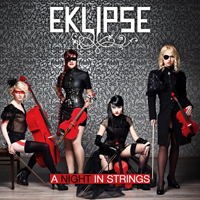 Four female musicians (in strings?) playing classical interpretations of pop and rock songs... well I like the album as a prefect resting point between a heavy dose of aggressive metal, and they are surely talented and their versions are for most parts more interesting than the original if you ask me... amazing how well the Coldplay song transforms to classical music. But, I am not so sure how many of our regular readers will be picking this one up... not even because of the pictures...!